This world can be a scary place. Turn on the news and you can see why I say this. I only have one small child and luckily I can protect her from a lot of the stuff this world has to offer, which most times is not good. 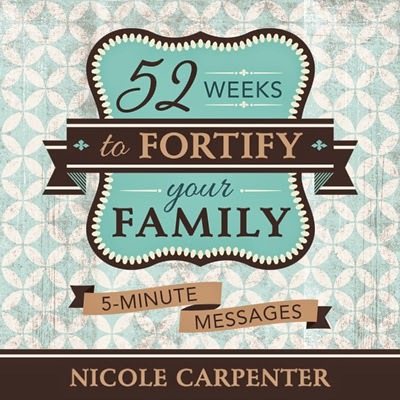 When I heard about "52 Weeks to Fortify your Family" I wanted to get my hands on it. If I can help my family navigate this crazy world we live in then I wanted to wanted to be part of it. When I had the opportunity to review this book I was excited. I believe the best way to fortify yourself and your family is through our Lord and Savior, Jesus Christ. I also believe that there needs to be a place on earth that your family feels safe. It needs to be in other words "heaven on earth". I want that to be my home for me and my family. This book provided and still provides this for my family. It only takes 5 minutes each day, but it has made a WORLD of difference in my family and my home in general. If you want to to notice a difference and fortify your family then read this review and pick up a copy for yourself. I will answer some commonly asked questions when I have talked about the book to others to help you get a better idea of what the book is and what it is about. The book is full of 5 minute daily inspiration to help your family be strengthened in a crumbling world. The book focuses on different topics each week. You can choose to go in order or you can choose what your family needs that week. There are also 7 weeks that go along with different holidays. So I have planed to do those weeks on the week of the corresponding holiday. 2. What's my favorite part of the book and why? I would say my favorite part is technically not a "part". I like the fact that it can be customized to what my family needs on a certain week. I also love how it is packed information especially scripture (Bible, Book of Mormon, Pearl of Great Price, and Doctrine and Covenants) and questions to go with the scriptures to get me to think a little more about what I am reading. 3. What 3 things did I like about the book? 1. I like the categories that I can choose from. 2. I like that it is simple, but packed with information and inspiration to help you get through the day. 3. I also like that each week has a supporting conference address. Conference talks are always on my list to read, but this has helped me actually read them because I want to surround myself and my family with inspiration surrounding the certain topic I am on that week. 4. What 3 things do I not like about the book? This really isn't a reason about the book, but it is about the format of the book. I have an e-book version and I plan on getting a hard copy because I want to mark up the book and make notes. I usually like tangible books over e-books anyways. So I am excited to get my own hard copy. Other than the format of the book I I love it. 5. Who would I recommend this book to and why? Anyone that wants more daily inspiration for themselves and their family. My daughter doesn't fully understand what is being said, but it makes a difference in my thoughts during the day. I am a better mom and wife when we start off the day reading the scriptures and turning our thoughts to the Savior. This book does not have to be for a family either it is great for individuals. I wholeheartedly recommend this book. I am planning on giving it as gifts to many friends and family members. You can pick up a copy for yourself at Amazon or at www.fortifyyourfamily.com.